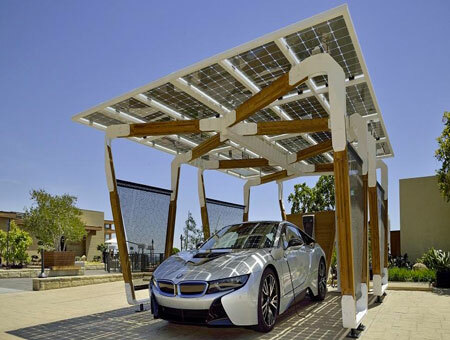 heliosolaire offers several models of photovoltaic carport allowing you to become a producer of photovoltaic electricity with the useful surface of the shelter of your vehicle. Two possibilities are possible, either to resell photovoltaic electricity produced at ERDF with a 20-year contract or to consume the electricity produced and thus increase its energy autonomy. heliosolaire offers you its photovoltaic solar carport in order to make useful the surface of your shelter electric or conventional vehicles. The carport that we propose is entirely in modular kit very simple to install in order to become producer of electricity. The heliosolar photovoltaic carports are available in three dimensions according to your project in 20m2 for 3Kwc, 40m2 for 6Kwc and finally 60m2 for 9Kwc. A sleek design for a modern architectural integration in your environment with several models offered or the design and structures have been carefully crafted. 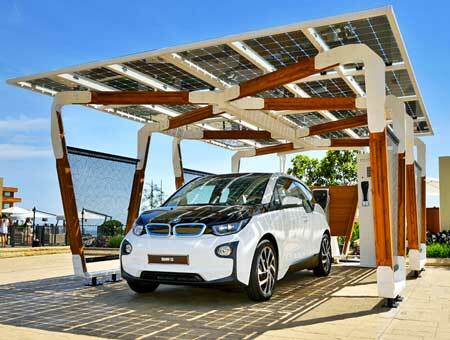 Solar carport: how does it work ? In the case of a total injection of the photovoltaic electricity production as with a photovoltaic installation on a roof, the photovoltaic carport injects its energy production into the network by previously passing through a photovoltaic inverter and a production meter for the resale to ERDF of its generated energy. Thus, you become an electricity producer with a 20-year obligation to purchase contract and benefit annually from the resale of your photovoltaic energy with a yield of around 10%.